Brooks Richard is so certain he’s going to be a LSU Tiger in 2033 that he chose to make his entrance into this world while his mother was visiting his grandmother in Baton Rouge. They arrived back home in San Antonio yesterday. Congrats to Chris & Ashley and the entire family! 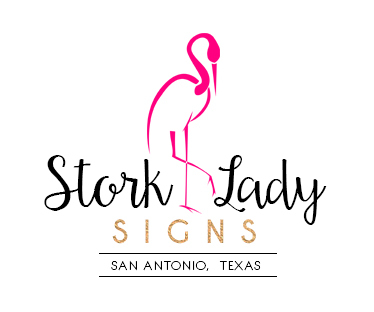 Stork Lady Signs has the cutest storks in all of San Antonio, TX. 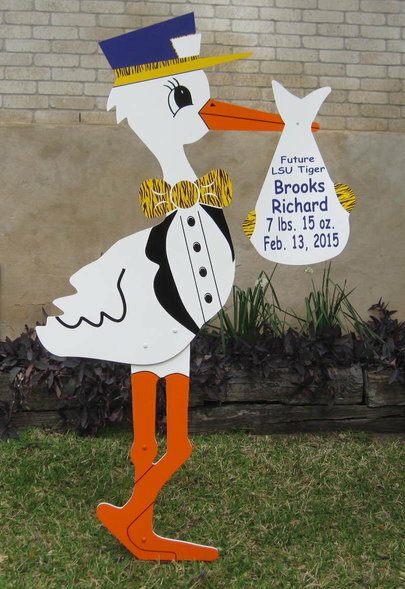 Please contact us at 210-601-7351 to rent a stork sign to welcome home your new baby or grandbaby. We serve Alamo Heights, Alamo Ranch, Castle Hills, Converse, Fort Sam Houston, Lackland Air Force Base, Leon Valley, Lincoln Heights, Live Oak, Universal City, Hollywood Park, Kirby, Olmos Park, Randolph Air Force Base, Shavano Park, Stone Oak, Terrell Hills, The Great Northwest, Windcrest, Garden Ridge, Helotes, Leon Springs, Edgewood, Boerne, New Braunfels, Rio Medina and all of the greater San Antonio, TX area. Please visit our to see our most recent rentals. And be sure to check out our video on .